After installing the base system, you get a console environments. 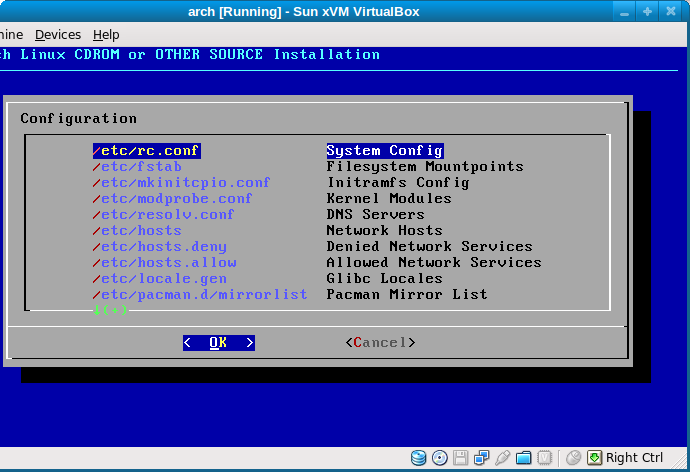 From there you can install the desktop environment of your choice. While installing arch I used the Beginners Guide without which I wouldn’t have gotten anywhere. The Archwiki generally is a master piece. Not only does it tell you what to do, it also tells you why its necessary so that in the end you will be making an informed decision, its like a school of Linux and am not ashamed to say that i learnt a lot about Linux just by reading it. 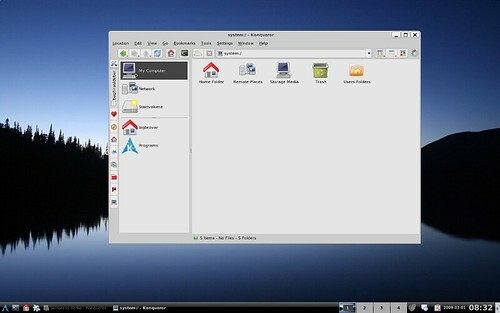 Its different from the official branch of kde which is also available in the arch repository. KDEmod is developed by the Chakra project . 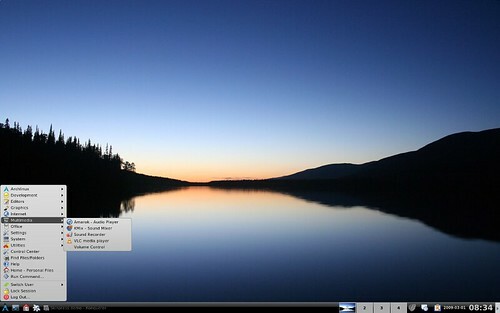 As a disguised KDE fanboy I naturally went for KDEmod as my desktop environment of choice. 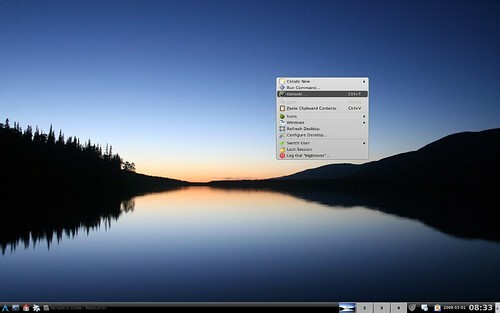 (I love the K Desktop but Kubuntu does a poor job of KDE hence I run gnome on my laptop which runs ubuntu 8.10) I choose to go for kdeMOD3 which is based on kde 3.5.10. I was able to setup everything using the guide I found here Here . In true Arch spirit I installed A basic functional Desktop, the KDEmod theme and some basic applications to get me started. Arch is built on the principle of Keep It Slim & Simple. Its a minimalist Linux Distribution that has a lightweight base structure allowing the user to shape the system according to their lifestyle. Unlike some Linux Distribution based on the Just work principle which although cool, but also means that lots of modules and packages are enabled by default many of which the user has no need for and would never use. Arch does things very differently. Nothing is enabled unless you do it your self (even when I installed ssh I had to specifically add sshd to the daemon array in /etc/rc.conf otherwise the ssh daemon will not run on startup. same for alsa,hal,even kdm. while some may not like this approach, for many others who would like to maintain a strong control on everything that run on their computer, Arch is definitely the way to go). It installs just the Archlinux base from which the user can then gradually build his system the way he wants. 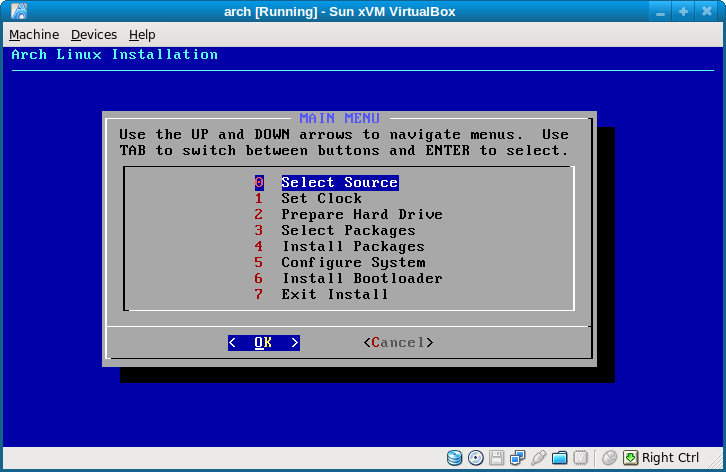 I installed it on an old desktop and arch allowed me to install just what I needed for the desktop to function. I dont use wireless so naturally wireless tools are not installed and unlike ubuntu where Modaliases for the NVIDIA and ATI drivers are installed by default to enhance auto detection. On arch all I did was install the xf86-video-intel which is needed by my system. This approach allows me to keep my system slim and unbloated. However my experience with arch wasn’t all a jolly jolly ride. I did encounter some problems. mainly being unable to get auto-mounting of removable device to work. i tried everything in the wiki but had to leave with the problem for over 2 weeks before a dude in identica pointed me to this link from the arch wiki which fixed the problem for me. Another factor which might put people off archlinux is the amount of work which goes into setting up your system to your taste especially if you want to set up a general multi purpose system. The flip side is once things are up and running arch is good to go and its very stable and rock solid.